A former police officer who was wrongly accused of leaving her fingerprint at a murder scene is being sued by police for £13,000 in legal fees. 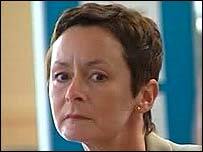 Shirley McKie lost a £100,000 claim for damages against the chief constable of Strathclyde Police in 2002. Now the force is trying to reclaim the expenses involved in fighting the case. Ms McKie's father Iain said the case had "destroyed" his daughter and appealed to Chief Constable Willie Rae to halt the action for legal fees. Mr McKie expressed feelings of "outrage, injustice, unfairness and being kicked when you are down". "It is just yet another blow after seven years of blows," he told BBC Radio's Good Morning Scotland programme. He said Mr Rae, who was not chief constable at the time of the case, was an honourable man. "He apologised to us on behalf of the police many years ago. "This man has honour in him and I appeal to him to stop this," said Mr McKie. "My daughter has been destroyed by this and I have got to sit and watch it and I can't take much more of this." An "emotional and upset" Ms McKie said she would pay the money due to the force but she said it might mean selling either her home or her car. Ms McKie said she felt like Strathclyde Police and the Scottish Executive were taking turns to kick her about. "This feels like they are just stomping up and down on my head," she added. Ms McKie was a detective constable when Marion Ross, 51, was found murdered at her home in Kilmarnock in January 1997. David Asbury, 27, from Kilbirnie, was later jailed for life for her murder, but had his conviction quashed last year. 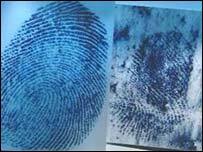 During the investigation, fingerprints were found on a door frame at the victim's home. A report by the Scottish Criminal Records Office (SCRO) said that one of the prints belonged to Ms McKie. During Asbury's trial, she denied that the print was hers. She was arrested later and charged with perjury but was acquitted after a trial in 1999. She launched legal actions against Strathclyde Police and the SCRO claiming malicious prosecution. The latter case is continuing against Scottish Executive ministers, who are responsible for the actions of the SCRO. However, Ms McKie lost her claim against Strathclyde Police in 2002 after Lord Emslie ruled that she had not demonstrated that her former colleagues acted with malice. Mike Russell, who used to represent the South of Scotland as a list MSP, described the force's latest move as "outrageous". "I think most people would find it astonishing that having been cleared of a wrongful accusation in 1999, relating to a matter for which she was suspended from work in 1997, she is still having to fight court cases in order to get the most basic of compensation," he said. "When you add to it the actions of Strathclyde Police, who now want to put her in a position where she might lose her house, I think most people would regard that as beggaring belief. "They may be entitled to the money legally but they are not entitled to it morally after the suffering that Shirley has gone through." A spokesperson for Strathclyde Police said it was usual for expenses to be awarded to the successful party in a legal case. "The total amount of the expense, which is to be recovered from Ms McKie, is still the subject of further proceedings," said the force. "However, an undisputed amount of £13,000 is presently being sought from Ms McKie. "Ms McKie has not yet indicated either directly or through her representative any unwillingness or inability to pay the sum of £13,000, therefore it would be premature to mention what steps, if any, may be open to the chief constable to enforce recovery." "After her trial, she lost an action for damages"